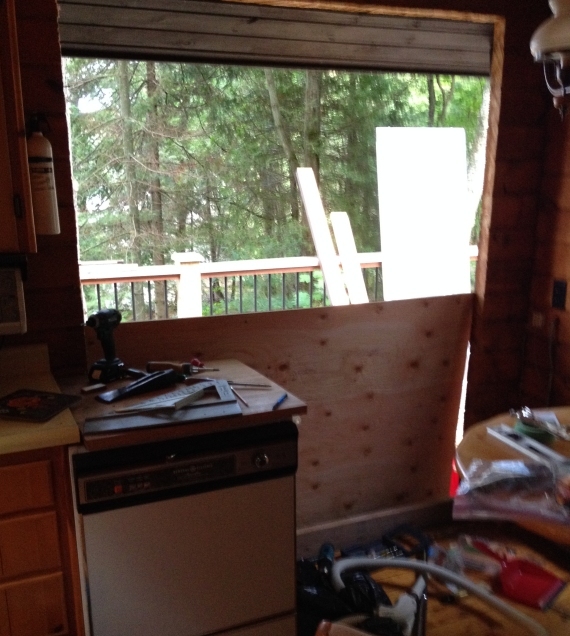 Our kitchen at the cottage is undergoing renovations and my wonderfully talented husband is doing all the work. It actually started last fall…. We wanted to open up a wall between the kitchen and living/dining room, so we knew we were losing scarce kitchen cabinetry. Stage 1, last fall, was to build this unit for the dining room, so we could move dishes and other kitchen supplies here while the renovation was ongoing. 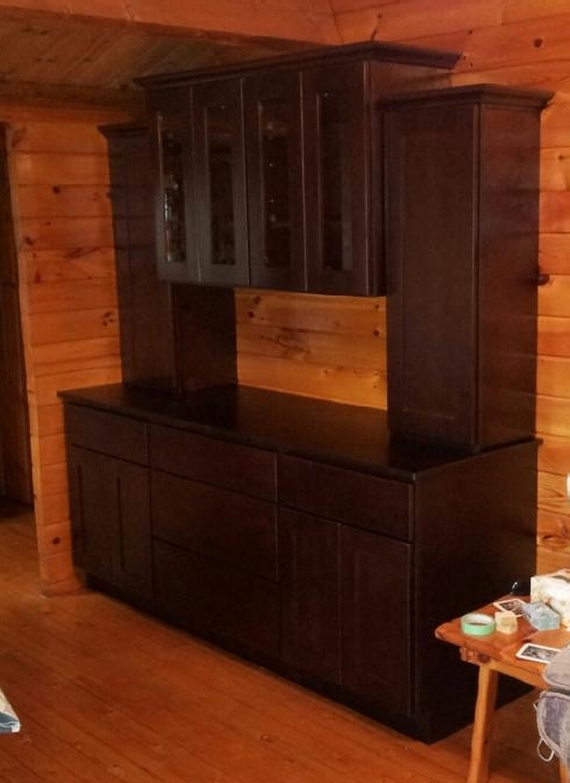 A local kitchen place sold the pieces to make the individual cabinets, and Steve designed and put them all together. I love it! In June, the wall was opened up! Now I can be part of the conversation going on in the living room, while I’m cooking! There’s green painter’s tape marking the positioning of cabinets, and also which electrical circuits go with the various switches, since he was doing lots of re-wiring. At the end of August, Steve started replacing the windows. A sliding glass door that was never used was replaced with a window, and the other two windows in the kitchen were replaced as well. 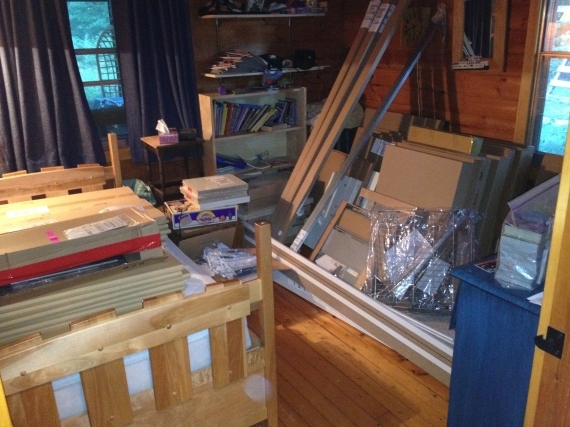 Early in September, we got a delivery from Ikea – 131 items (including knocked down cupboards, drawers, butcher block for the counters, trim pieces and all the hinges and packages of legs). It has taken over one of the bedrooms! 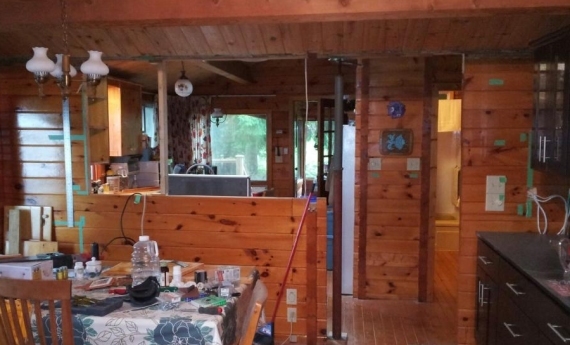 Since then, Steve has replaced the kitchen lights, rewired the stove so it can be moved, insulated the walls under the windows, installed a range hood and is now starting to assemble the cabinets. He built this one about 2 weeks ago, just so he could see some of the final product (not yet in it’s permanent location) . 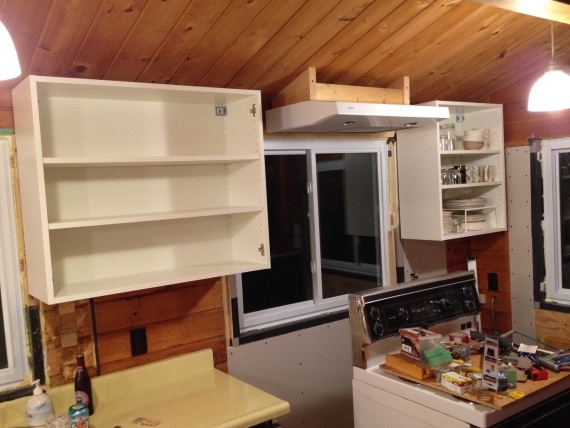 This weekend, he installed two of the upper wall cabinets (although the doors aren’t on yet). The location of everything in the kitchen (dishes, cutlery, etc.) changes daily, and the stove seems to be forever covered in tools (not cooking ones! ), but that just means we use the BBQ more often. We shopped for back splash tiles today, too. There’s still lots to do, but the end result is going to be fantastic! 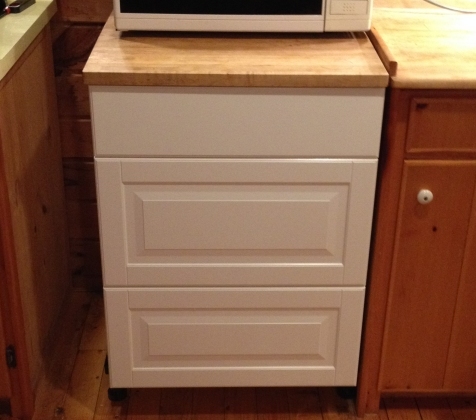 This entry was posted in Cottage and tagged cottage kitchen, renovations. Bookmark the permalink. I’m totally jealous! It’s going to be fantastic when it’s done!